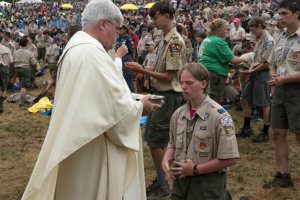 IRVING, Texas – The leaders of the National Catholic Committee on Scouting, which has its headquarters in the Dallas suburb of Irving, said they “accept and work with the new membership policy of the Boy Scouts of America” to admit girls. The Boy Scouts currently have 2.3 million members, less than half than the 5 million they reached in the 1970s, at the peak of the post-World War II baby boom. “It is the mission of the National Catholic Committee on Scouting to utilize and ensure the constructive use of the program of the Boy Scouts of America as a viable form of youth ministry with the Catholic youth of our nation,” said the statement from Sparks and Father Smith.